layer 7: The Application layer: It supports end user functions like Login,Password,fiel transfer. This layer contains sevice element to support application process such as job management,financial data exchange and business data exchange. Layer 6: The Presentation Layer: This layer is responsible for data compression,data expansion,data encryption and data decryption.it accepts data type from application layer and then negotiate with its peer layer as to the syntax representation. Layer 5: The Session layer:This layer adds mechanism to establish, maintain,sychronize and amanage communication betwen network entities. This layer has specific services, primitives and protocol data unit which are defined in ISO. 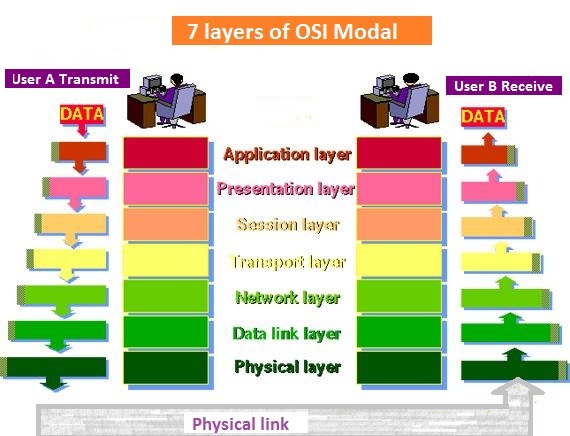 Layer 4: The Transport Layer: This layer is responsible for reliable end to end transfer.Hence optimum utilization of network resources.the transport layer performs the service of sending and receiving segments of data session laer.It also provides flow control ,sequence numbering and message acknowledgement. Layer 3: The Network Layer: This layer specifies the intra network operations and differnt types addressing and routing services.Logical and service addressing are provided from network layer. It also provides switching control and terminal connections.It HAndles the routing of the data.The Network Layer does routing and forwording. Layer 2: The Data Link Layer: This layer is responsible for the transfer of data over the channel.It groups zeros and ones into frames . A frame is a series of bits that forms a unit of data. DLL detects and corrects the transmission errors using error correction method.It also provides data flow control to ensure that the data Terminal Equipment (DTE) does not become overburdend.It identifies the device on the network.